No one is more cherished in this world than someone who enlightens the pupils with this rich knowledge and wisdom and such is the persona of Vidyasagar School Principal Dr. D. C. Sharma. He joined the Vidyasagar School, Indore on July 1, 2015. Prior to this he rendered his dedicated serviceto top public schools of India like the Punjab Public School, Nabha as Deputy Headmaster from October 2011 to June 2015 and the Daly College, Indore from 1995 to 2011. Dr. Sharma is armed with an impressive list of qualification. He did his B. Sc., M. Sc., M. Phil with First Division and Ph. D. in (Botany) Plant Physiology & Phytochemistry from the institute of Advanced Studies, Meerut University, Meerut. He has earned the distinction of completing university certificate course in “Yoga” from Devi Ahilya University, Indore and certificate course of Counsellor and Education Administration from PTA, Delhi. In addition to these he also has PG Diploma in Science Communication with distinction grades from Center for Science Communication, Devi Ahilya University, Indore and B. Ed. with First Division from Barakatullah University, Bhopal. His profile speaks volumes about his successful academic and professional record. He was a part of illustrious The Daly College, Indore for almost 16 years and a half wherein he successfully discharged his duties in various capacities like Head of Department of Biology & Biotechnology, Coordinator Sports & Games, Housemaster, Senior Boarding House, NCC Officer, Career Counselor, Coordinator Sainik School Entrance Examination, Rewa and Home Examination Incharges: DEAS, Adventure Activities, Educational Tours & Sundry assignments. He has to his credit establishing single handedly an ultra modern & well equipped Biotechnology laboratory at The Daly College, Indore. Dr. D. C. Sharma a strict disciplinarian was commissioned into NCC Air Wing in 1997 by Air Force Administrative College, Coimbatore and stood first in order of merit and was awarded a gold medal. In RCs from Administrative College and Air Force Stations, he was adjudged the Best Officer and awarded with highly coveted trophies for the same. 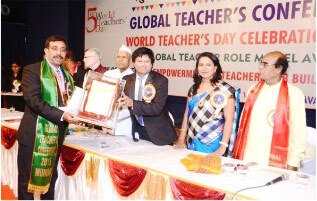 He is a recipient of various prestigious awards & honours like Global Achiever Award 2016, Global Teacher Role Model Award, National Excellence Award for Education in Top-10, ALMAASC UK, Londan, Glory of India Award and Shiksha Ratan Award for his contribution in the field of education and was also awarded fellowship as Senior Research Fellow (SRF) by the Department of Biotechnology (DBT), Govt of India & worked creditable in the field of Gene Cloning at the prestigious SIS Jawaharlal Nehru University, New Delhi. Dr. Sharma takes keen interest in Social work and environment and has been associated with Watershed Development programmes in tribal areas of Madhya Pradesh, Social and Environment Awareness Programmes, health and hygiene campaigns against drugs, smoking and alcohol. He was one of the fortunate few to work with Late Shri Baba Amte. Coming to his sporting talent Dr. Sharma has participated in Cricket and Badminton at college level and in National Handball. He has a great passion for Adventure Activities, Art & Craft, Photography, Environments and Science Communication. He is an Equestrian freak too. This Robust and Dynamic personality reveals that “The real man of achievement are people who have heroism to fuel more and more enthusiasm in their work”.